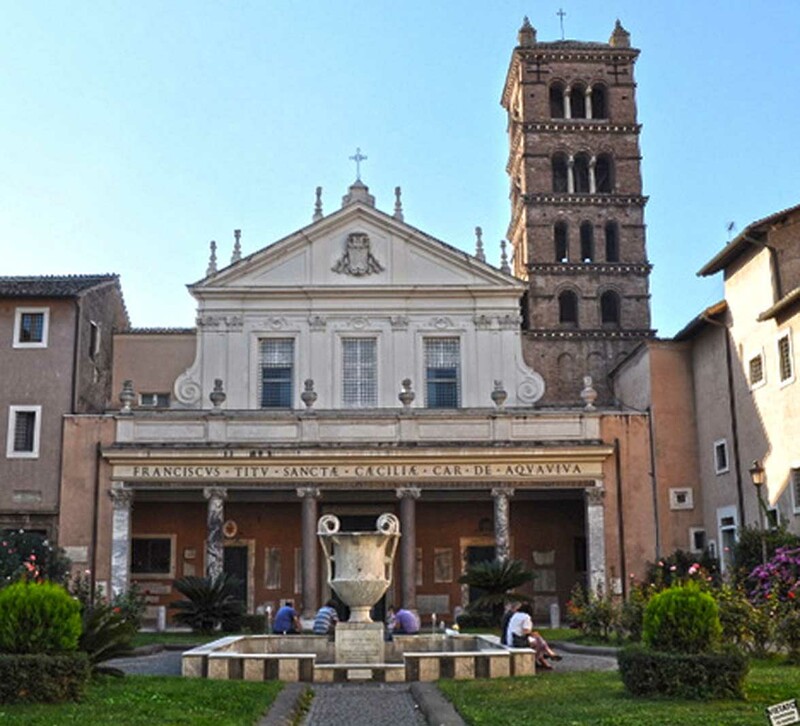 The veneration of the third century Saint Cecilia, in whose honour a basilica was erected in 5th Century Rome, extended far and wide because of the Passion of St Cecilia that presented her as the ideal of a Christian woman in an age of persecution. Nothing much is known of St Cecilia, and the Passion is clearly a mingling of history and legend. But embedded in the memory of the early Church was the story of this woman whose love for the Lord and witness to the Gospel was responsible for the conversion of a large number of people. In turn it also led to her heroic martyrdom. St Cecilia was added to the Canon of the Mass in 498. She is regarded as the patron saint of music and musicians because of her ability to hear heavenly music in her heart. She is often represented in art with an organ or organ-pipes in her hand. I offer you today a little cluster of passages from the Scriptures as well as from other sources. Taken together, they inspire us to live and worship as part of the heavenly chorus with whom we offer our love and praise to the Lord. The diapason closing full in Man . . . I waited patiently for the Lord; he inclined to me and heard my cry. He drew me up from the desolate pit, out of the miry clay, and set my feet upon a rock, making my steps secure. He put a new song in my mouth, a song of praise to our God. Many will see and fear, and put their trust in the Lord. Praise the Lord! Praise God in his sanctuary; praise him in his mighty firmament! Praise him for his mighty deeds; praise him according to his exceeding greatness! Praise him with trumpet sound; praise him with lute and harp! Praise him with timbrel and dance; praise him with strings and pipe! Praise him with sounding cymbals; praise him with loud clashing cymbals! Let everything that breathes praise the Lord! Praise the Lord! Do not get drunk with wine, for that is debauchery; but be filled with the Spirit, addressing one another in psalms and hymns and spiritual songs, singing and making melody to the Lord with all your heart, always and for everything giving thanks in the name of our Lord Jesus Christ to God the Father. After this I looked, and lo, in heaven an open door . . . At once I was in the Spirit, and lo, a throne stood in heaven, with one seated on the throne! . . . And the four living creatures, each of them with six wings, are full of eyes all round and within, and day and night they never cease to sing, "Holy, holy, holy, is the Lord God Almighty, who was and is and is to come!" And whenever the living creatures give glory and honor and thanks to him who is seated on the throne, who lives for ever and ever, the twenty-four elders fall down before him who is seated on the throne and worship him who lives for ever and ever; they cast their crowns before the throne, singing, "Worthy art thou, our Lord and God, to receive glory and honor and power, for thou didst create all things, and by thy will they existed and were created."
. . . we can think of creation as God’s song, and the Holy Trinity as the divine musician. The Father is the origin of the song. If you like, he knows the tune. But without words, and without breath to produce the sound, it is not a song. And so, when the Father sings, then by his Word, and with his Breath, which both proceed from him, the song of creation is being sung and sustained in being. So, the old song, if you like, is creation itself, and by his divine act of singing, God causes all that is, and holds everything in being. Marvel at the wonder of the world around you, and indeed, at your own being. For all creation, by its very existence, tells the glory of God … like a glorious symphony, and in perfect polyphony. But then, God’s Word itself takes part in this symphony of creation. As Pope Benedict said in his recent apostolic exhortation, Verbum Domini, “In this symphony is found, at a certain point, what might be called in musical terminology a ‘solo’, a theme given to a single instrument or voice; and it is so important that the significance of the entire work depends on it. This ‘solo’ is Jesus”. The entry of Christ into God's creation, heralds a fresh outburst of song. We find that the New Testament begins and ends with song, from the canticles in Luke’s Gospel to the canticles of the Apocalypse, and all these songs form a central part in the Church’s liturgy; we sing them everyday. And in a sense, these are the new songs based, if you like, on the musical theme introduced by Christ into the symphony. But I think Christ not only adds his voice to the song of creation and becomes a part of it, but actually he introduces a new song. Indeed, the eternal Word has taken on the flesh of music, so to speak, and as St Clement of Alexandria said, Christ has become incarnate as the New Song. St John says that “no lie was found” in the mouths of those who sing the new song. And this is because the song they sing is Christ who is the Truth. And the new song of Christ is greater than the old song of creation because the singer and the song is God himself. And so, when we are called as Christians - children of the new creation - to sing a new song, we are being invited to rejoice and participate in the life and being of God himself. So, to sing the new song means to harmonize our lives with Christ; to live the life of grace in Christ. Jesus is the new song that we, the redeemed, can learn to sing, and we are able to do this when we have him in our minds and in our hearts, as St Cecilia did. But to sustain this song we need the breath of the Holy Spirit, allowing ourselves to be filled with God’s grace. And then, as we do every morning, we simply ask the Lord to open our lips, so that, with our very lives, we can praise his name, and sing his new song. Praise the Lord with the lyre, make melody to him with the harp of ten strings! Sing to him a new song. Rid yourself of what is old and worn out, for you know a new song. A new man, a new covenant; a new song. This new song does not belong to the old man. Only the new man learns it: the man restored from his fallen condition through the grace of God, and now sharing in the new covenant, that is, the kingdom of heaven. To it all our love now aspires and sings a new song. Let us sing a new song not with our lips but with our lives. See how he himself provides you with a way of singing. Do not search for words, as if you could find a lyric which would give God pleasure. Sing to him “with songs of joy.” This is singing well to God, just singing with songs of joy. But how is this done? You must first understand that words cannot express the things that are sung by the heart. Take the case of people singing while harvesting in the fields or in the vineyards or when any other strenuous work is in progress. Although they begin by giving expression to their happiness in sung words, yet shortly there is a change. As if so happy that words can no longer express what they feel, they discard the restricting syllables. They burst out into a simple sound of joy, of jubilation. Such a cry of joy is a sound signifying that the heart is bringing to birth what it cannot utter in words. Now, who is more worthy of such a cry of jubilation than God himself, whom all words fail to describe? If words will not serve, and yet you must not remain silent, what else can you do but cry out for joy? Your heart must rejoice beyond words, soaring into an immensity of gladness, unrestrained by syllabic bonds. Sing to him with jubilation. Our music is the sound of Jesus' name . . . We mean, of course, that our liturgies are outbursts of the grace already always present in the pain and shadows, the joy and the lucidity and intractable mystery of human life and love. We sing, if we sing, because we are involved in the fearful and beautiful and truth-telling story of God's redemptive presence at the heart of human life – no less present when we are naked and friendless than when we are sheltered and loved, the first presence promising the second. The art, therefore, of liturgical song is not the composer's and performer's alone. Nor is it restricted to those who can articulate music’s meaning or appeal. Liturgical participation and song belongs also to the listener. Some members of the assembly are more likely to sing – at home, in the community and during worship – than are other people, and some people will sing at one time and not another. Nor is it accidental that we so often use musical metaphors to express the whole range of human responses (including non-vocal and inaudible ones) to the unnameable one, the God whose face is revealed in the Gloria we so indifferently sing on most Sundays . . .
Our liturgical songs are not recordings made in sound-proof rooms by people attuned to nothing but the sound of music. They are rather an integral part of the drama; they follow a pattern, but they are live, not staged. They begin were where we are, mute and bowed in sorrow for our sins (or maybe just feeling small); then, if words shoot up, they bid us raise our eyes and then ourselves to the table of salvation. Participation in the liturgy, at times through glad singing, at times in rapt or restive silence, and sometimes just by sheer physical presence, frees us to contemplate things that cannot be reasoned and to see what cannot be seen: behind or beyond the enchantments and defeats of the ordinary is God – never-moving God, who sees everything, even the dark unspoken – and the love and courage to live again for one anther. We sing for a better life and for a justice that transforms the lives of the oppressors as well as the lives of the oppressed.